The home textiles industry in northern India is robust and growing, supplying retailers worldwide with pillows, throws, poufs and other soft home goods. Similar to the carpet industry, suppliers rely on extensive outsourcing of informal labor at the subcontractor and homeworker level. And as in the carpet sector, many companies conduct spot checks on first-tier suppliers, while problems occur at the bottom of the chain where companies lack visibility. With support from the UK Government’s Modern Slavery Innovation Fund, GoodWeave is working with global brands to establish and test a new sourcing model in India’s home textiles sector. The approach establishes and monitors strict no child labor and no forced labor standards and requires suppliers to meet these requirements at all tiers of production down to homeworkers. GoodWeave is also working closely with communities to offer child protection and educational opportunities, as well as support to homeworkers to improve the quality and efficiency of their production. The pilot’s approach includes supply chain mapping through all levels of production as well as the establishment and monitoring of strict no child labor and no forced labor standards. Suppliers are required to meet these standards at all tiers of production, down to the homeworker level. Throughout the supply chain mapping process, the GoodWeave India team will identify potential locations and lay the groundwork to initiate its child-friendly community (CFC) program. The CFC approach uniquely combines direct educational support for child laborers and at-risk children with advocacy and community engagement to create long-term government support for schooling. targeted training on how to improve efficiency and quality to earn higher wages. 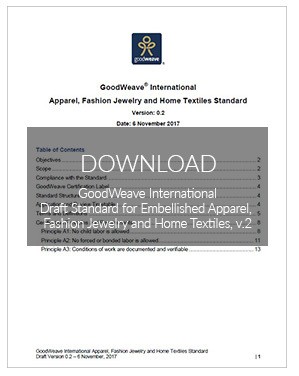 This pilot leverages GoodWeave’s existing infrastructure, including its expert team and strong community relationships, with the goal of establishing a commercially viable certification program for home textiles. GoodWeave invites additional partners including brands, retailers and NGOs to engage in this partnership and join the movement to end child labor in supply chains. Learn more about this draft Standard consultation.